IN THE second half of 2014, Kota Kinabalu saw few launches across all sectors with most developers focusing on the sale of leftover units from earlier launches. However, the overall outlook continues to be optimistic in the medium to long term, according to Knight Frank’s Kota Kinabalu Market Outlook for 2H2014. “The pace of development continues to head upwards as the state capital transforms itself into a modern coastal city despite the unfortunate events that took place in 2014 such as the aviation tragedies and security issues in the east coast,” says Knight Frank (Sabah branch) associate director Ginn Lai. According to the report, the city landscape was set to change by end-2014 with the expected completion of several large-scale integrated developments such as the Loft apartments, Imago shopping mall, Riverson and Gleneagles private hospital, Oceanus shopping mall and Pelagos Suites. It states that the lack of new launches in 2014 will lead to pent-up demand from investors, although the domestic affordability gap is expected to widen with higher land prices and construction costs, as well as the implementation of the Goods and Services Tax in April 2015. Lai foresees that Bank Negara Malaysia’s tightening of lending conditions and the anticipated hikes in interest rates will carry through to 2015. As household debt levels continue to be reined in, he expects new projects to get lacklustre response until lending conditions improve. He says the success of new launches in 2015 will also be dependent on the pool of well-heeled local buyers and the untapped foreign investor market. The Tanjung Aru Eco Development (TAED) that covers 299ha along the Tanjung Aru beach is poised to create new tourism assets for Kota Kinabalu, cementing Sabah’s position as a world-class tourist destination. According to the master plan, TAED — which is divided into seven zones and will be sold via tender towards the end of 2015 — will feature 4,500 apartments, 150 villas, 475 terraced houses, six hotels, retail spaces, a golf course and marina. It aims to reserve half of the land as public open spaces and strives to be a Green Building Index-certified township. The north corridor of the city, which will be the main focus for new developments and launches next year, will see the highly anticipated Jesselton Quay and Kota Kinabalu Convention City (KKCC) projects. The report expects strong investor interest in these two projects. Sutera Harbour Resort is expected to release the Sutera Harbour apartments in the market in 2015. The development is under the new ownership of Singaporean-listed conglomerate GSH Corp Ltd. According to Lai, the project should gain international appeal and attract new investors to Sabah. SBC Corp Bhd’s Jesselton Quay and Mah Sing Group Bhd’s KKCC are paving the way for the regeneration of the old Jesselton port area that will also house an international cruise terminal and international convention centre. Both are mixed-use developments and will comprise a combination of retail, office and residential properties, as well as hotels. Several other major mixed-use developments, such as the Aeropod, Sutera Avenue and PacifiCity, continue to progress while their new phases are well received by the market, evident in the favourable take-up rates. The report reveals several notable land transactions in Kota Kinabalu such as the purchase of a 0.915-acre plot in the city centre for RM21.9 million by Profile Wide Sdn Bhd, a one-acre parcel in Karamunsing for RM9.81 million by Vuitingsen Hotel Sdn Bhd and a 2.75-acre tract in Luyang for RM41.5 million by Bertam Alliance Bhd. Between January and August 2014, the state recorded 2.16 million tourist arrivals, which is the same as the previous corresponding period. The [email protected] commercial hub by Tan Brothers Machinery Co was launched in June 2014 and is slated for completion in 2017. The development sits on 1.94 acres in Jalan Bundusan and is set to redefine the city landscape with 12 blocks of 4-storey commercial shopoffices, 12 units of dual-volume sky food and beverage (F&B) outlets on level five, a 6-storey boutique hotel and a basement car park. The shopoffices are priced at RM2.6 million onwards and the F&B outlets, RM600,000 onwards. In Penampang, Donggongon Avenue was launched in April 2014 by Homesign Network Sdn Bhd and is expected to be completed by end-2016. The development sits on 3.04 acres and commands an estimated gross development value (GDV) of RM100 million. It consists of 18 units of 6-storey semi-detached class A boutique offices with built-ups of about 9,620 sq ft and priced between RM5 million and RM5.8 million each. According to the report, the project’s take-up rate of 77% to date is evident of Sabah’s resilient and stable property market. Meanwhile, a tripartite development agreement has been signed between the Sabah United Chinese Chambers of Commerce (SUCCC) and the United Sabah Chinese Communities Association of Kota Kinabalu (USCCA) as landowners, and developer Arah Permai Sdn Bhd for the RM300 million GDV City Point Complex, which has been renamed Wisma Tiong Hua Sabah. The 16-storey development will occupy 2.7 acres in Karamunsing and will feature 318 units of five-star hotel suites in two tower blocks (the tourism hub), four levels of branded retail outlets, a banquet hall that has a capacity for over 200 tables, a 5-storey car park with 1,000 bays and offices for the SUCCC and USCCA. Another notable commercial development is Avenue 8, located along the Jalan Tuaran bypass. The RM148 million project is undertaken by Bina Puri Properties Sdn Bhd, a wholly-owned subsidiary of Bina Puri Holdings Bhd, and Kensington Development Sdn Bhd. It will feature a 13-storey block that offers 55 units of commercial lots — 14 units of 2-storey/duplex and 41 units of simplex lots — and 259 units of small office/versatile office suites. 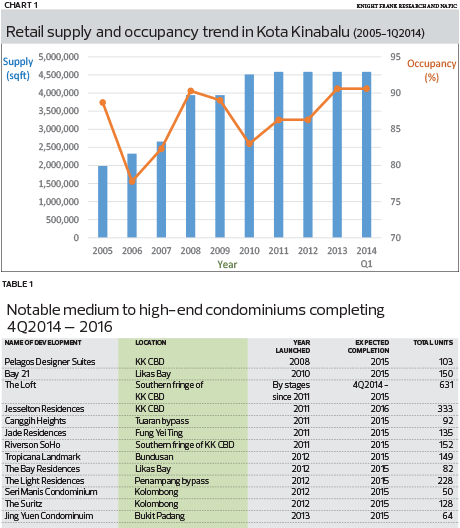 The year 2014 saw a few notable residential launches, including the Harrington Suites by Interland Properties. The development is located at Damai and features 116 units with five layouts. Unit sizes range from 2,445 to 3,455 sq ft and priced between RM1.8 million and RM2.9 million. Located at the suburb of Hilltop is Jesselton View by Bina Puri Holdings Bhd. The low-density apartment development offers 80 units, which are housed in 5-storey and 11-storey blocks. The units have built-ups of between 809 and 2,922 sq ft and are priced from RM533,000 to RM2.08 million. At the southern fringe of the Kota Kinabalu central business district (CBD) is the Sutera Avenue Residences by Mah Sing Properties, a wholly-owned subsidiary of Mah Sing Group. Its launch in January saw the release of 320 units of serviced apartments spread across three towers — 100 units in Tower 1, 120 units in Tower 2 and 100 units in Tower 3. The units have built-ups ranging from 726 to 1,220 sq ft and are priced at RM605,000 onwards. The Menggatal township will see a 24.6-acre development — Greenfield Residences — by Greenfield City Sdn Bhd. The project will offer six layouts of two and three-bedroom units. The units have built-ups ranging from 821 to 1,084 sq ft and are priced at RM300 psf onwards. Located at Kolombong is the Ashton Tower development by SCP Inanam 2 Sdn Bhd, a subsidiary of the SCP Group. The 28-storey tower offers 391 condominiums with built-ups of 870 to 948 sq ft and prices ranging from RM361,800 to RM504,000. In the Kota Kinabalu CBD, the monthly asking rents range from RM2.90 to RM3 psf for units in the Marina Court Condominium, says Knight Frank. Near the city centre, such as the locality of Signal Hill, asking rents range from RM2 to RM4 psf per month, and in the Penampang suburbs, from RM1.50 to RM2 psf. In terms of capital value, prime city condos are priced between RM800 and RM1,200 psf. In the past two years, there has been no new supply, and the existing supply of offices remains at 6.2 million sq ft with a healthy occupancy rate of 91.3%. Average yields stand at about 5% per annum, based on average current market values. Slated for completion in April 2015 is Menara Hap Seng, the first purpose-built Grade A commercial building in the city centre. The 14-storey building with green features comprises a 3-storey retail podium and 10 floors of offices. It offers 174,569 sq ft of net floor area at monthly rental rates ranging from RM5 to RM5.50 psf. Based on the report, the overall take-up rate has been positive, with Shell already having committed to four floors of the building. Located at the southern fringe of the Kota Kinabalu CBD is the Riverson Suites by Riverson Corp Sdn Bhd, which is expected to be completed by 2015. The 6-storey building comprises 60 office units with built-ups of 20,000 sq ft on each floor. 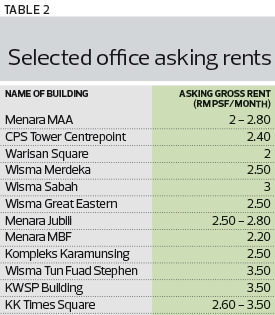 Currently, the asking rents for offices range from RM2 to RM3.50 psf per month. In KK Times Square, the asking rents are between RM2.60 and RM3.50 psf per month and in Wisma Tun Fuad Stephen and KWSP Building, RM3.50 psf (inclusive of centralised air conditioning). Since the completion of Suria Sabah in 2009, retail space supply in Kota Kinabalu has remained constant at 4.6 million sq ft with an average occupancy rate of 86.3%. “We foresee exciting times for the retail sector when the anticipated new retail developments, such as the Oceanus Waterfront Mall, Imago Mall at KK Times Square Phase II and Riverson Walk, come onstream in 4Q2011/1Q2015,” Lai says. These developments are located in the southern corridor of the city. The Oceanus Waterfront Mall, which is developed by Sunsea Development Sdn Bhd, is set within the Kota Kinabalu City Waterfront development. The mall fronts a 2km waterfront boardwalk that overlooks the seafront, with F&B outlets strategically lined along the boardwalk. The development is set to be a prime tourist attraction, offering waterfront lifestyle and leisure. Strategically located at the southern fringe of the Kota Kinabalu CBD and next to Sutera Harbour Resort are Imago Mall and Riverson Walk. Imago Mall, a 4-storey Grade A retail complex, boasts more than 300 outlets and a net lettable area of about 800,000 sq ft. The mall will offer international and local brands such as H&M, Topman/Topshop, Tumi, Kate Spade, Michael Kors, Burton, Swarovski and Victoria’s Secret. The Everrise Group, which has confirmed its expansion into Sabah by opening stores at PacifiCity Mall, will also have outlets at Imago Mall. The mall is developed by Syarikat Kapasi Sdn Bhd, a wholly-owned subsidiary of Asian Pac Holdings Bhd. Riverson Walk, which is part of the Riverson mixed-use development, will consist of 247 retail outlets with sizes ranging from 100 to 937 sq ft that are specifically tailored for boutique retail businesses. It aims to complement the other components of the integrated development, which includes a medical centre, office suites and small office/home office suites. This article first appeared in City & Country, The Edge Malaysia Weekly, on January 5 - 11, 2015.